This bold and beautiful panel arrived last week and we quickly made it into a wall hanging by adding a small black inner border and a 6-inch border of coordinating fabric. The panels are only $7.99 and we have a cheat sheet at the shop with the yardage required to replicate what we did here. This would brighten up your sewing room, a teen's room, your kitchen, a bathroom, or most any room in the house. 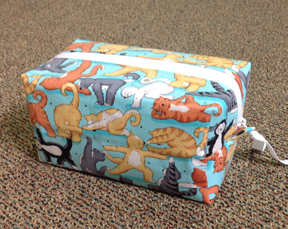 We've had this cute pattern for a while and finally got around to making a sample. 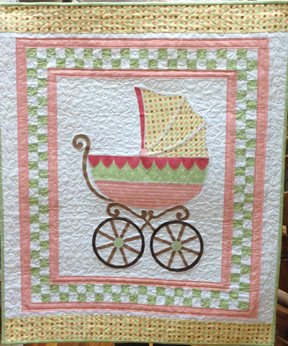 This wall hanging measures 30" x 37" and would be adorable in any nursery. We have kits made up in this colorway or we will help you choose fabric to create your own masterpiece. This zippered bag can be made and embellished to be as elegant or as playful as you’d like. 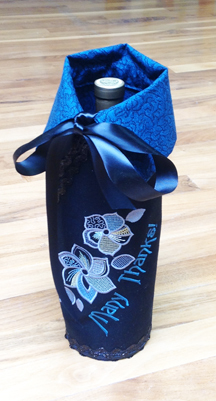 Use it as a hostess gift when giving a bottle of wine, sparkling cider, or even a nice bubble bath. This unique bag has a zipper that extends from around the base all the way to the top. When it’s unzipped it lies completely flat. Get creative by putting an applique or embroidery design on the front. Cindy Dahl will teach this class, and one of our many BERNINA embroidery machines will be available if you’d like to use it on class day. one-year anniversary as a BERNINA dealer! 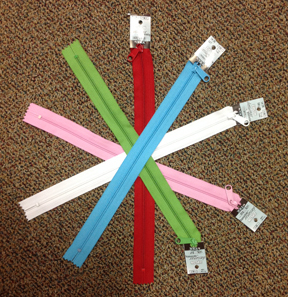 Tuesday, February 24, 2015, 5:15 p.m.
Zippers can be practical or decorative and they’re not as challenging to sew in as you might think. You simply need to know a few tricks of the trade for zipper success. 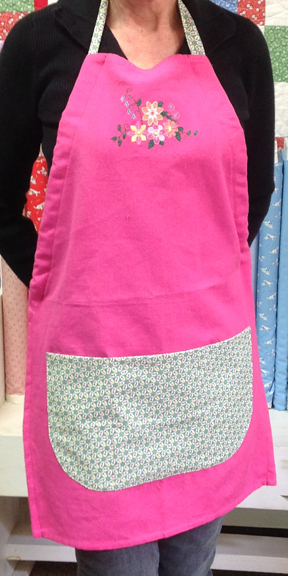 Learn techniques for easy zipper insertion and build your confidence at BERNINA Club this month. We’ll explore standard and invisible zipper insertions, sewing zippers onto sticky fabric such as vinyl, how to add zippers to different types of projects, and more. You to NOT need to own a BERNINA to attend this event. Zippers are zippers . . . all machine brands welcome! Call us at 970-565-7541 to sign up for BERNINA Club or send an e-mail to cindy@cortezquiltcompany.com. Only 7 spaces left for Plain & Fancy! 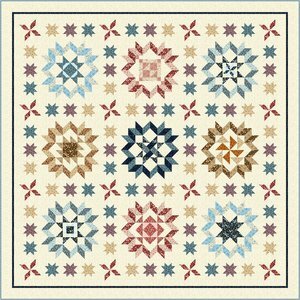 Don't miss the opportunity to make this beautiful 82 inch square quilt, one block and one payment at a time. The program begins on March 1, 2015 and wraps up in November (nine months total) and the cost is only $27.99 per month. Call 970-565-7541 or stop by the shop to sign up today. If you live out of town we're happy to mail your kit each month. Here are a few tips that will help you achieve greater accuracy and finished blocks that come out to the size you intend. 1. Don't rush the cutting process. Slow down to make sure that each piece of fabric is cut correctly. Use the same brand of ruler throughout a project. We like Creative Grids for both their markings and non-slip backings. Using the same line of rulers throughout might not always be possible, such as when your project calls for a special ruler, but when you can stick to your favorite brand. 2. Make a consistent 1/4" seam. Check your 1/4" presser foot to determine if it's making an exact 1/4" based on where you place your fabric. Sew a seam and actually measure it. Too often what looks to the eye to be 1/4" is actually quite scant or overly generous. You can also slide a ruler under your presser foot and gently lower your needle to see where your 1/4" is. Note that some patterns specifically call for using a scant 1/4" seam and some quilters consistently sew using a scant 1/4" seam. Experiment and see what works best for you. 3. Pin, pin, pin. 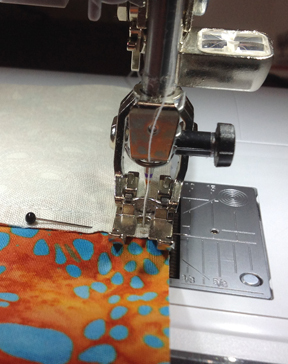 Pin every intersection when piecing and remove pins as you sew up to them after your machine needle has pierced through the multiple layers of fabric that are at the seam intersection. Stop sewing with the needle in the down position, gently remove the pin (don't sew over them! ), and then proceed with your seam. See image above. 4. Press like a pro. Always "set" your seams by applying heat to the stitch line before opening it up your fabric to press in one direction or to press a seam open. Press gently so that you don't stretch your fabric, but make sure that there is no "play" left once a seam is pressed. In other words, make sure your seams lay nice and flat as you piece your blocks together. We love the starch alternative Best Press and sell it here at the shop in 16-ounce spray bottles and by the gallon for refills. It's an amazing product. 5. Measure as you work. In addition to measuring and squaring up quilt blocks before doing your final assembly, be sure to measure block elements as you go. 6. Use the right tools. In addition to rulers, there other tools that can help with accuracy. Use a rotary cutter that feels good in your hand and replace the blade when you notice "skipping" or just have trouble cutting through layers of fabric. Use a good quality cutting mat, but unless you're cutting a piece of fabric larger than any ruler you own, don't rely on the mat for measuring. Your rulers are more accurate. A 1/4" foot (see above) is essential for even semi-serious quilters, and consider investing in a single hole stitch plate for your machine if you don't already have one. Make sure your work area has good lighting. Do you have other tips that help you with accuracy? E-mail them to us and we'll work them into a future tips column. Happy piecing! If so, we might be looking for you! 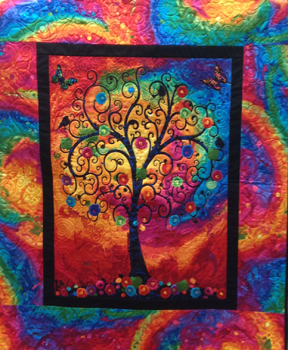 We are ready to add a new person to our team here at Cortez Quilt Company. This job involves providing superior service to customers in both the fabric/notions and sewing machine departments. The ideal candidate will: be happy, energetic, have a positive attitude, and enjoy people; learn quickly and have the ability to multi-task; be organized, self-directed, possess a strong work ethic, and have good computer skills; be confident and have the ability to listen well and communicate clearly; be respectful and committed to the success of our business; have basic math and color skills. Retail, sales, and/or sewing experience is helpful but not required. We will train the right person. This position is full-time including some Saturdays and occasional evenings. Benefits include paid time off, a bonus program, employee discounts, and a pleasant environment. We have fun while working hard. If you meet these qualifications and are interested in being considered for this position, please bring your resume and complete an application at 40 West Main Street in Cortez on or before March 7. We are open Monday-Saturday from 10 a.m. until 5 p.m. No phone calls, please. If you were here for class or Quilt 'Til You Wilt on Friday and you're missing a thread spool holder we found one.